The varnish removal is finally complete! The detail of the brushwork in the Poedua’s face and hair have been revealed and we are one step closer to getting this painting ready for display. The canvas face down on the table with the stretcher removed (which can be seen on another table in the top right). The leather weights hold the canvas in position while it is loose. Photograph taken by Melanie Carlisle, 2011. © Te Papa. During the varnish removal we discovered a damage on the stretcher which meant that we needed to take the canvas off the stretcher for structural repairs. We were hoping to avoid this step to maintain the historical integrity of the original attachment of the canvas to the stretcher, but in the end the care of the painting would be compromised if we did not. We lay the painting face down on a clean table covered with Tyvek and carefully removed the original tacks from the tacking edges and lifted the stretcher away from the canvas. There was an enormous amount of dust caked onto the canvas and the stretcher member at all sides, particularly at the bottom edge. This gave us opportunity to clean the canvas and the stretcher in these areas. At the bottom edge of the canvas lots of caked-on dirt was found which was caught behind the stretcher member. Photograph taken by Melanie Carlisle, 2011. © Te Papa. Even more dirt in the bottom corner, plus some pieces of straw (most of the straw was removed when the painting was still in London - see previous post). Photograph taken by Melanie Carlisle, 2011. © Te Papa. 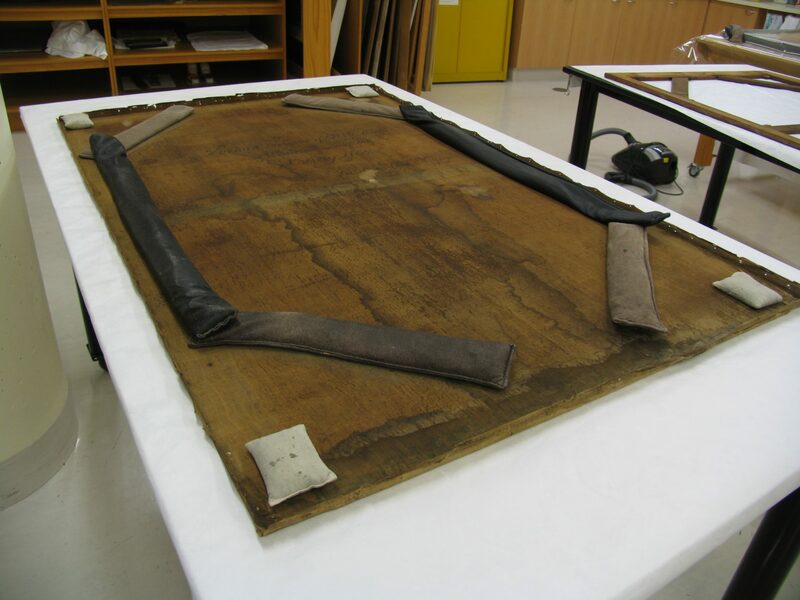 Next we attached a strip lining to the canvas for two reasons, to add structural support to the brittle and fragile original tacking edges, especially in the corners and also to allow us to have something to hold onto when restretching the canvas onto the stretcher. 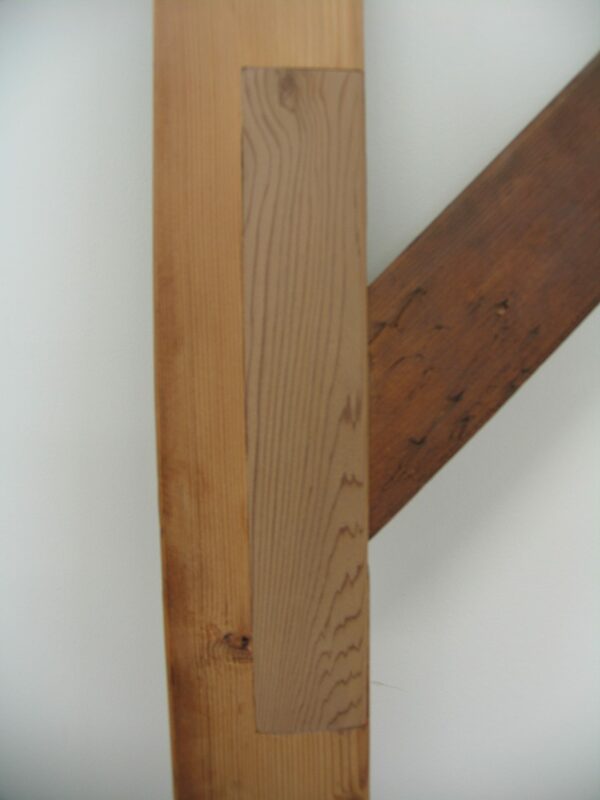 The join in the stretcher and the offending split in the wood. Photograph taken by Melanie Carlisle, 2011. © Te Papa. In the above photograph the damage to the stretcher can be seen. This part of the join was just too thin and has split apart. 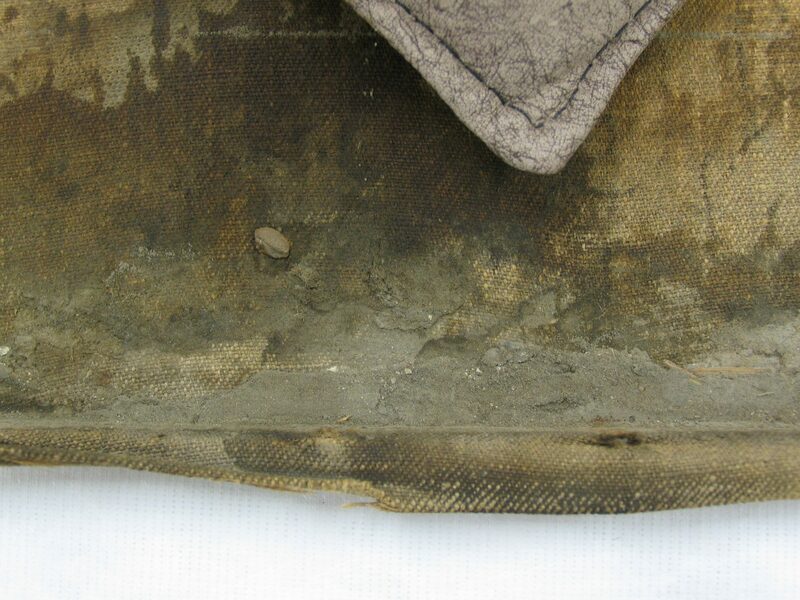 The split area was pressing against the back of the canvas which was why it was essential to remove the canvas from the stretcher for this repair. We discussed options for the structural repair of the stretcher with our object support team and decided on removing part of the stretcher and replacing it with a wooden insert. 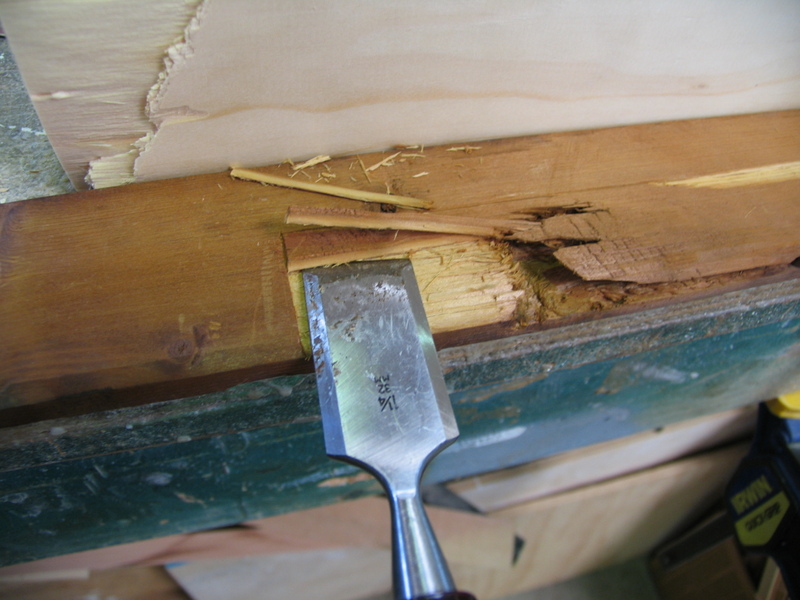 A small section of the stretcher surrounding the damage was removed using chisels. Photograph taken by James Kirk, 2011. © Te Papa. The repaired join after the wooden insert has been attached. Photograph by Melanie Carlisle, 2011. © Te Papa. 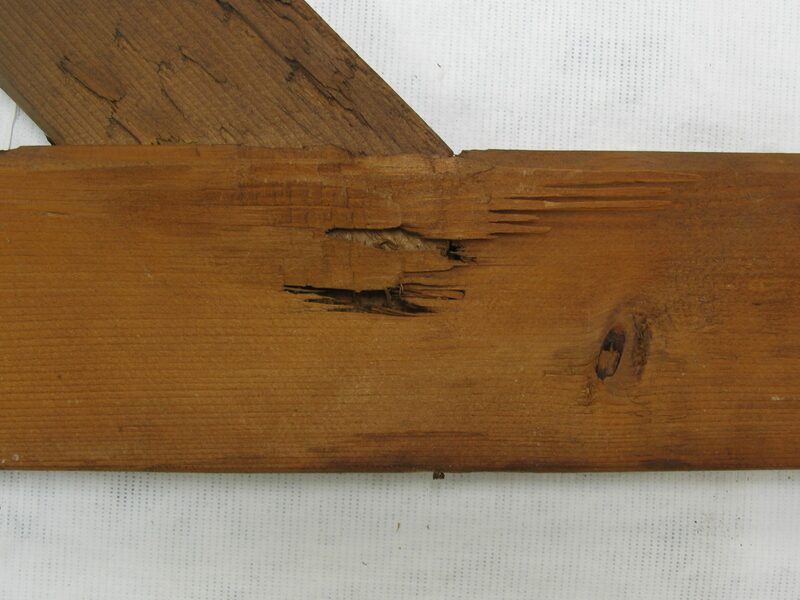 This interventive treatment was seen as the best way of maintaining the historical integrity of the original stretcher. 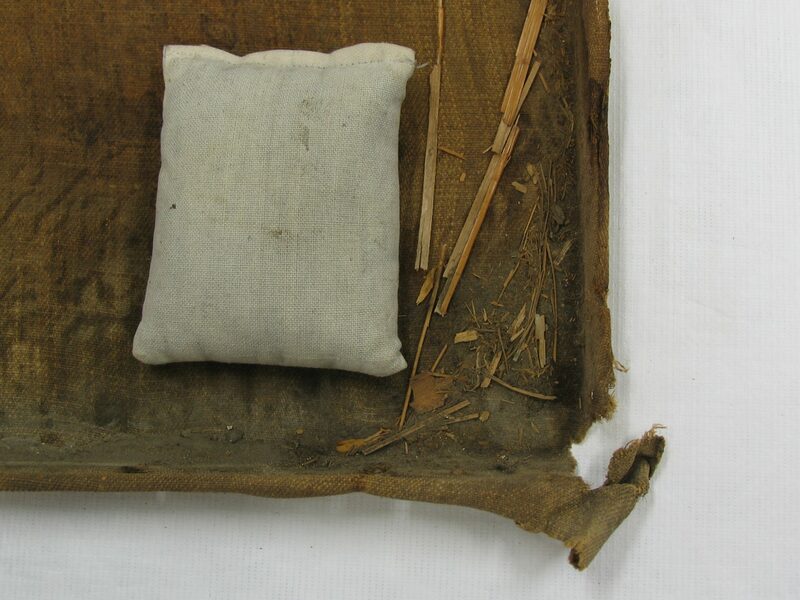 In the past the original stretcher may not have been giving the same importance and would have been replaced with a new and improved stretcher but modern conservation practices dictate a much different approach. The stretcher was repaired, cleaned of the dust and dirt and reassembled. We restretched the canvas, attaching the strip lining at the reverse of the stretcher using stainless steel staples. The original tacks were cleaned or loose dust, dirt and corrosion in an ultra-sonic bath and then replaced in their original holes in the canvas and the stretcher. 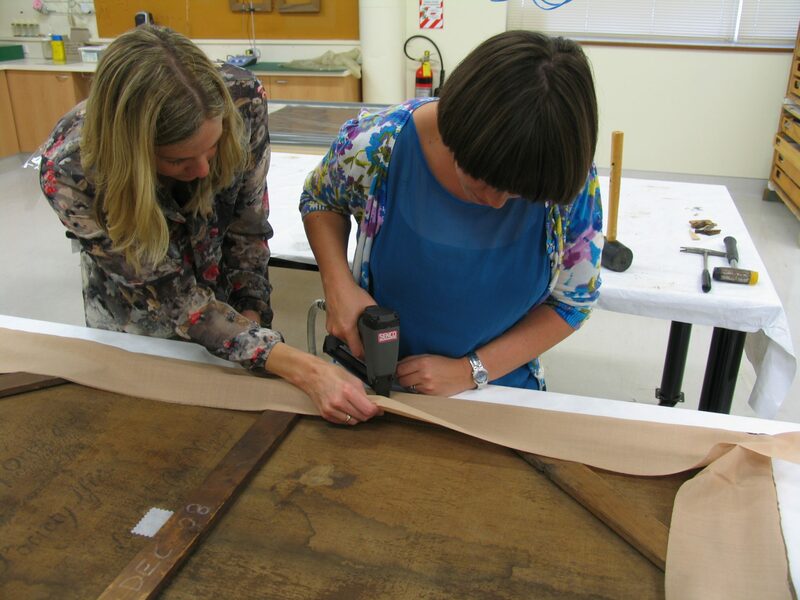 Katherine and I restretching the canvas and attaching the strip lining canvas at the back with staples. Photograph taken by Drew Ward, 2011. © Te Papa. The tension of the canvas has been improved and the fragile tacking edges are now supported by the strip lining. Next is the removal of the old overpaint and fills which we will discuss in our next post in the early new year. We were given a James (John) Webber lithograph, Plate No 29, of a Tahitian woman with a headdress, as a wedding present many years ago by a collector of Pacific artefacts. It was bought at Christies in the early 1970’s. Reading about Webber, he obviously used Poedua as his muse for several of his paintings/lithographs and I wonder whether our lithograph is of her, although our Tahitian seems more “petite” than the picture of Poedua in the newspaper. Would someone at Te Papa please be able to confirm this for me?